Recipe for Fitness: STRESS... What is it good for? STRESS... What is it good for? We all experience it. We learn to cope with it, or ignore it, or implode with it. Stress is so negative, isn't it? Or is it? Recent weeks have been quite stressful, for myself and my family. We're grieving the inevitable loss of our beloved family pet, we're dealing with business and family challenges, along with individual challenges we each face. As there are six of us, between the bunch, we've got a lot of stress ;-) And that's not even counting the events of this last year. 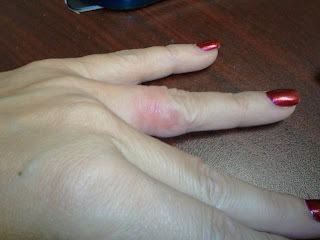 One of the ways stress makes itself known with me is eczema. A delightful condition which causes swelling, broken skin and misery. I've had it since I was a teenager and burned my hand on a pizza oven. The result was intense medical therapy for the next six months as my family and doctors tried to bring it under control. Why that event triggered what would become a lifelong condition - no idea, but it's there, and it's not going away. When I get super-stressed, it pops back out. Thankfully, 99% of the time, it's limited to my hands. Unfortunately, it hit my ring finger this time. My wedding ring finger. UGH. I detest removing my wedding set. I really do. Especially when I spend so much time in the gym where there are creepers. You know, those guys that follow you around, stare, grin like maniacs whenever you lift a weight, and make googly eyes at you. EW. swollen so that my rings didn't fit. Boooo. Anywho... Stress. It's bad, right? It causes flareups like my eczema, or someone's GI upset, or headaches, etc. Physical distress is a very common result of stress. But while that's true, there's more to stress than just pain and suffering. That physical response is our bodies' way of saying, "Hey, pay attention! Time for change!" Not dealing with stress is the problem, not necessarily the stress itself. Life is full of stress, and unless we're going to live in a bubble, it's going to touch us. The challenge then, is to use the stress, rather than being at its mercy. One positive thing I am doing is using the stress to force myself to be more confrontational. Not in a bad way, just that I'm standing up for myself more. There are areas in my life where my passivity has created stress - things I do have control over, that I haven't controlled previously. There are some areas in my life and job where I'm recently taking the proverbial bull by the horns, and it is stressful. Let me repeat that: IT IS STRESSFUL. But the end result will be worth the emotional pressure cooker I'm experiencing now. Stress is what makes a lump of coal a diamond (ok, that's super oversimplifying it, but you get the idea). Stress is what makes us sharper, stronger, smarter.. if we face it in a healthy way. I'm doing my best to be healthy. To face the challenges instead of ignoring them. To recognize the signs of stress, and adjust and evaluate accordingly. Our bodies are amazing warning systems. When those first little blisters start pushing up, I know that I have to stop and think about what's going on (and reduce sugar so it has less fuel!). It's a sure-fire sign that I am pushing stress down, instead of dealing with it. What are your stress-symptoms and how do you deal with them? Music - You've heard the adage, 'music soothes the savage beast', right? It's true. My music collection is crazy-eclectic. When I get stressed, I turn off the power gym-tunes and switch to soothing music by Loreena McKennitt, Dido, Enya, David Arkenstone, Diane Arkenstone, Sarah McLachlan... those other-wordly notes calm my heart and mind. Exercise - You knew that was going to hit the list, didn't you? ;-) Seriously though, exercise is an incredible stress-reliever. It's an outlet. A place for you to pour every bit of emotion out and leave it on the floor. Whether you're angry, scared, worried... whatever, you can use that and purge it with a hard workout and/or cardio session. There are physiological responses to exercise that result in improved mood and stabilized emotions. But it's temporary, you say - sure it is. That's why you make it a habit. Every day, give yourself the gift of that outlet. Food - Wait, what? Am I encouraging you to stress eat? No, but there is a comfort we receive from food. Whether it's related to childhood memories, or something else, the textures, tastes, scents all reach out to us and offer an easing in our souls. Rather than being derailed by it, take control of it. Create a file of clean-eating comfort food recipes that you can turn to when things get stressful. Find #BeatStress tips at the Eat Clean Diet website! Keep an eye on the site and Tosca's blog this month as they share tips for beating stress.